After taking third place with Melandri in Race 1, the Aruba.it Racing – Ducati team took another podium at Imola (Italy) with Chaz Davies. The Welshman, who started from pole position after finishing Race 1 in fourth position, led the race for 10 laps while pulling away with Rea to finish second in front of the ducatisti fans who filled the stands. Melandri was instead forced to retire due to an accident during lap 8. The Italian was in fourth position and well within podium contention when he was unfortunately hit by another rider under braking, a contact that fortunately didn’t result in any injuries but forced him to retire. Michael Ruben Rinaldi enjoyed a memorable start, leading the race for the first two laps, then he faced a small drop in pace to finish in seventh position once again with the Aruba.it Racing – Junior Team. After five rounds, Davies (162 points) and Melandri (131 points) are respectively second and fourth in the championship, while Rinaldi is twelfth. 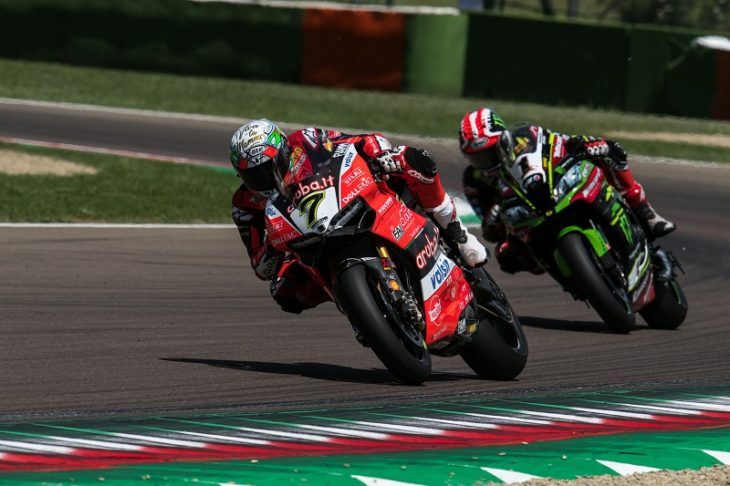 The Aruba.it Racing – Ducati team and the Aruba.it Racing – Junior Team will resume action at Donington (U.K.) for the fifth round of the WorldSBK Championship, scheduled for May 25-27.